Everyone loves an underdog and Konami's football title has been just that for a number of years now. Top dog is of course FIFA, but snapping at its heels has always been PES. Over the years, PES has actually been a better sim than its competitor - and by better we mean more fun. The ball has moved across the pitch with more zip, and you could have games with goals galore. Ah fun times indeed. 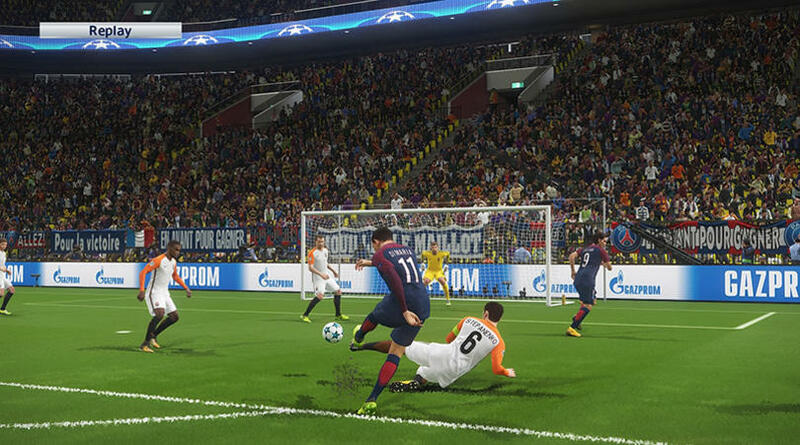 And now PES 2018 is here and we can't help but feel underwhelmed. A consistent gripe has been the user interface; this latest iteration looks no different from all other versions, and still looks like it's a closely related to the Windows 95 operating system. It's remarkably clunky and offensive to the eye and looks like it belongs in a museum for old bad things. In short, it's poo. Don't mind me, I'm just doing my pilates down here. Obviously it still doesn't have all the official clubs and players, due to FIFA holding the licenses to ransom which means they'll never slip out of their evil grasp. But like the ugly interface, you can look beyond that. Just. That said, they have the license to some teams, including our own, Arsenal - don't judge. Even then however, in one of the campaigns, we chose to be Arsenal, but wearing the distinctive strip were a bunch of randoms, most of whom we had never heard of. Either have the team as is, or allow the player to chose his own side, but don't fill an established side full of players you've never heard of. At the heart of the game, as always, is the MyClub feature. It's the closet you get playing through various campaigns and have a fair amount of control over the players you manage. 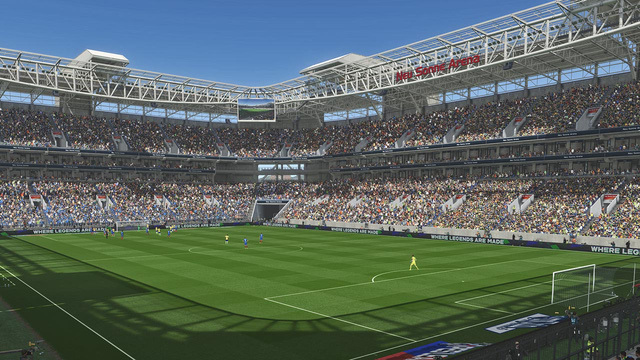 Like FIFA, if you want stadium fillers, you'll have to cough up and pay for them, virtually or otherwise. If not, you make do with what you're given. This is the area where you will normally find us, fiddling about in a division, trying get enough points to be promoted. Thankfully you can still do this, but, to our disgust, the offline option has been removed. Now this won't be a problem if you're made of sterner stuff and prepared to take on the abuse and taunts online, but we are sensitive souls and don't play well with others. If we can help it, we don't play with anyone else at all. So having this option removed is a massive blow for the likes of us. The game sadly let us down in other areas too. Trevor couldn't help but be disappointed with his seat. Regardless of how fast your wingers are, the opposition always have a player who can run as fast as you. Now we don't much about football, clearly being Arsenal fans, but defenders tend not to be as fast, if not faster, than forwards. And then if you do manage to string a few passes together and get close to the goal, you will be greeted by at least seven of the other team. Every time. How they get there so darn quickly - every time - is unclear, but it somewhat makes a mockery of the game being a football 'sim'. Become a Legend is an interesting curiosity. Much like FIFA's Be a Pro mode, you play as an individual and control only that player during matches. It's a different experience, made even more so by some creative camera work; if you suffer from motion sickness at all, then good luck with this one. There's a lot here, including the PES League, a global online competition, where you have the chance to win $200,000 dollars, if you're good enough. And that's a big if. Good luck with that. But the game feels like it has lost something along the way. There was a time when you could score goals for giggles; looking at our stats, over a fair number of games played (around thirty), our goal average was a laughable two. As much as we love an underdog, PES 2018 doesn't close the gap between itself and FIFA; if anything it has widened with this effort. Maybe instead of being a poor man's FIFA, Konami should take the franchise, even if it's just once, in a completely different direction. Perhaps more of an arcade version, with bobbleheads or something, just to offer a truly enjoyable alternative, instead of always chasing FIFA's shadow.